This product works exactly as advertised. It consists of a spring with a special 'tail' that is attached to the trunk lid by one of the trunk lid latch torx screws (torx driver is included with the kit). Once the spring is attached a plastic cap fits on the end of the spring and you are done. Now when you release the the trunk the spring pops the trunk lid up as it should. This is simple and effective device. I am glad I finally ordered it. This is a great product that works exactly as described. It was shipped promptly and I installed it in just a couple of minutes. Now my trunk opens with ease! Remove a bolt with provided tool, insert bolt through spring and reinstall. It's a 2 minute job, and the thing works. My problem is the 500% Corvette tax - but then, I didn't HAVE to buy it. Worthless item. The material surrounding the factory latch has no support under it. 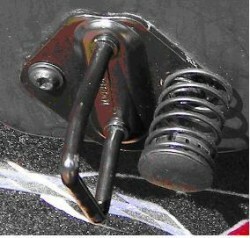 Thus, when the you close the trunk lid, the spring simply pushes the material down, and not against it. There's nothing solid to offer the spring any resistance. This spring should only cost $5, after all, its just a spring. But since it's for a Vette, they charge 400% more than what its actually worth. I took mine off to save my interior from getting pushed out of shape.